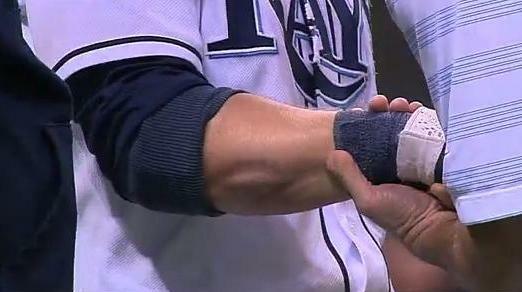 The baseball’s imprint can be clearly seen on Will Rhymes’ arm, moments after impact. This is obviously a fairly unique situation, but it is a perfect entre into the unwritten rule stipulating that players who have been drilled refrain from rubbing the mark. It has nothing to do with superstition and everything to do with public displays of macho. It’s the hitter telling the pitcher, you can’t hurt me. 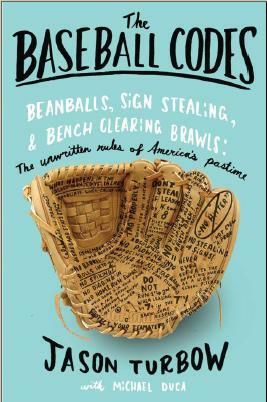 In baseball, let me say, there is a code that says, “Big-leaguers don’t rub.” You may have noticed that after a batter is hit by a pitch he may flex his shoulder or twist his neck a little but he will never rub the spot where he has been hit. If you ask any of them about it, they will always say, “Why should I give him the satisfaction of showing he hurt me?” This may sound rather naïve, since a pitcher who has just hit a batter behind the ear with a baseball traveling 80 mph has a mighty strong suspicion that it might have stung a little. What the players really mean is that there has somehow developed a code of honor which forbids them to make a display of any physical injury caused by an opponent. There are those, I’m sure, who would call it nothing more than the code of adolescence. I’m not among them. I would even dignify it, I think, by calling it not so much a code but a tradition—for any profession worth the name develops its own traditions. Courage and honor are not such commonplace commodities, now or ever, that they should be scorned. That said, pain levels can occasionally supersede bravado. Which brings us back to Rhymes, who can hardly be faulted for a reaction over which he very clearly had no control. The lack of actual severity—the second baseman sat out Thursday’s game, but is not expected to miss much time—may open him up to some ribbing from his teammates, but it’s pretty certain that none of them will hold this against him. After all, it could happen to anybody. This is the stupidest tradition I have ever heard of. If players are going to show that they are really not hurt, why even flex in pain. Shut up, throw your bat and run to first base like nothing happened. Good heavens, that ball left seems on the guys skin. Kinda sad you didn’t even mention Mike Matheny getting hit in the face with a pitch. Spit out blood, spit out some teeth, and walked away.